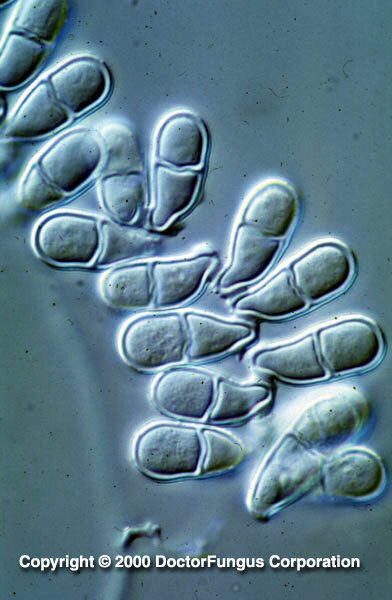 Trichothecium is a filamentous mitosporic fungus widely distributed on decaying vegetation and in the soil. It is commonly considered as a contaminant. Trichothecium causes pink rot of apples and is a parasite of fleshy fungi. No human or animal diseases due to Trichothecium have been reported. Trichothecium roseum is the only species included in the genus Trichothecium. See the list of active and obselete names for Trichothecium. No human diseases due to Trichothecium sp. have been reported. Colonies of Trichothecium grow rapidly. At 25°C and on potato dextrose agar, colonies are flat, granular, and powdery. From the front, the color is white initially and becomes pale pink to peach-colored. Reverse is pale. Trichothecium does not grow at 37°C [1295, 2144, 2202]. Septate hyaline hyphae, conidiophores, and conidia are visualized. Conidiophores are long and unbranched. They bear the conidia. Conidia (8-10 x 12-18 µm) are two-celled, smooth, slightly thick-walled, hyaline to lightly colored, and pear- or club-shaped. Their attachment point to the conidiophore is prominently truncate. They are organized side by side and form an elongated cluster. They overlap and form a zigzag pattern at the tip of the conidiophore. New conidia are produced and added to the bottom of this zigzag column [1295, 2144, 2202]. Trichothecium differs from Microsporum nanum by forming zigzag groups of conidia (compared to the solitary conidia of Microsporum nanum), by not perforating hair in vitro and by being inhibited with cycloheximide .